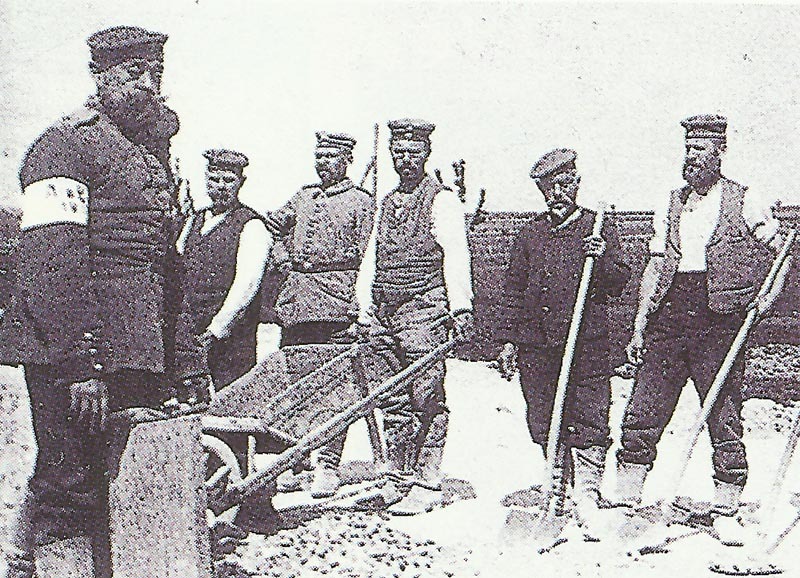 The voices against the war to be silenced: Karl Liebknecht (in the middle with wheelbarrow) during forced labor on the Eastern Front. Germany: In Reichstag Liebknecht demands immediate peace talks and votes alone against a new war credit. Britain: Munitions Inventions Department of 20 scientists and engineers (482 by January 1918) first meets. Kitchener to Churchill: ‘We have to make was as we must, and not as we should like to’. Poland: Beseler captures Novo Georgievsk with 90,000 PoWs (including 30 generals) and 700 guns. Gallwitz fighting Battle of Bielsk (August 19-25). 60,000 casualties since July 13. Isonzo: Italian writer Renato Serra killed on Mt Podgora, aged 30. Britain: Prime Minister Asquith to War Minister Kitchener, ‘… The Generals and Staff engaged in the Suvla part … ought to be court-martialled and dismissed from the Army’. Austria: Italy begins sustained strategic ­bombing including by night (31 Caproni Ca2s available 1915); 12 Capronis raid Austrian airfield at Asiovizza.